Come explore the grounds at the Extension Education Center and learn about the value of woodlands and fields in a new way. 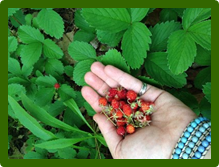 Presenters Tusha Yakovleva and Tracey Testo will be your guides to discovering wild edibles in your surroundings. Participants will learn what is available on a seasonal basis as well as how to collect food without disturbing or endangering a plant population. Recommendations will also be given on how to safely collect food with the help of local resources and experts. Following the walk, we will move inside where you will learn how to incorporate these wild foods into a meal. Locally foraged goods will be made available for samples and snacking during a Q and A to wrap up this fabulous day. Foraging is a great way to get to know your land as a resource for local foods. It can be a wonderful family activity and comes with a greater understanding of our interactions with the natural world. Sunday, May 6th 1-4pm. $20 per person. Register online at https://reg.cce.cornell.edu/spring2018foraging_210 by May 3rd.